Bloodhounds date back as far as Medieval Europe to the monastery of St. Hubert and before. They were bred to have a keen sense of smell to track boar and deer. The first time they were referenced in history was in a poem by Sir Humphrey de Bohun, Earl of Hereford in 1350 AD. 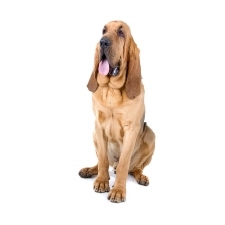 The bloodhound name translates as “hound of pure or noble blood.” Early Bloodhounds were known as St. Hubert Hounds as they were bred by monks at St. Hubert’s Abbey. Francis Hubert made it his life’s work to develop a dog capable of following old and cold trails. They were known as Sleuthhounds. Bloodhounds have an affectionate and even-tempered nature, making them excellent family pets. They are wonderful with children. Bloodhounds are courageous, confident and very determined, which helps in their tracking abilities. Bloodhounds usually weigh between 90-110 pounds. They stand approximately 23 to 25 inches tall. They have a sturdy build, characterized by long ears and a long face. They are famed for their amazing sense of smell. Their wrinkles, combined with the loose, pendulous skin beneath the neck and throat (dewlap) and their long ears, help funnel scent from the ground up to their nose and hold it there. They have a lifespan of about 9 to 11 years. Bloodhounds are rated on the average intelligence level. They are so skillful in their sense and tracking ability that their “testimony” is the only dog testimony allowed in a court of law. A documented story of a Kentucky Bloodhound named “Nick Carter” tells of a dog that followed a trail 104 hours old, leading to the discovery and arrest of the fugitive. This same dog’s skill resulted in the capture and conviction of more than 600 criminals.